Despite its namesake, Furious 4 has more in common with Borderlands than Gearbox's other series. As a fan of Brothers in Arms, especially Hell's Highway, I was disappointed to see that the latest entry in the series forgoes all the strategic depth and serious storytelling. Gearbox plans to continue Matt Baker's story in a different game, but for now we have Furious Four: An unexpected, offshoot that has little to do with the BiA series and a lot to do with Borderlands. Four-player co-op, cartoonish visuals, comedic dialog, leveling and character-specific abilities, for starters. The live demo of Furious 4 centered around a mission with the goal being to kill Hitler, by invading Nazi grounds while they are in a drunken post-Oktoberfest haze. The Inglorious Bastards inspiration is obvious, even if Randy Pitchford and Gearbox continue to dodge the comparison. The characters are ridiculous and macho, bordering on 80s action film parodies. The cast includes Chok, a Tomahawk-wielding Native American, and Montana, who you can tell is the group's heavy because he carries a Gatling gun. The differences between the four characters aren't as drastic as the ones in Borderlands at first, but once individual characters unlock abilities (by killing Nazis) they start to gain their own identity. During the demo, Montana unlocked the ability to set bear traps with grenades within - a brutal, makeshift landmine. "Over the top" doesn't begin to describe the absurdity Furious 4 embraces. 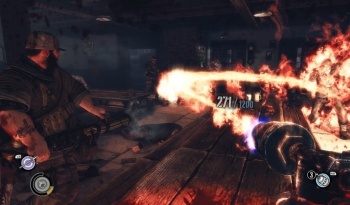 The game revels in propelling the player through a mindless onslaught, where points and achievement progress bars (a la Gears of War 2) pop-up every second. The game even applauds your accuracy and combos with flashy text ("double kill", "bullseye") The HUD is a bit cluttered from the constant feed of points/achievement information, but the game makes nice use of Splinter Cell: Conviction stylized floating, in-game text. Mission names and goals are written within the game world, even enemy helicopters are accompanied with "Wreck this thing" commands. Even though Gearbox seem to have no qualms with taking you out of the game's world, they didn't slack off in designing it. The Oktoberfest level is wonderfully rendered with a giant Ferris wheel centerpiece, which eventually collapses in spectacular fashion. The interiors of Nazi cabins have warm tones, while the outside had a bright, cartoony look. It's similar to Borderlands, but you wouldn't mistake one for the other - especially, when you factor in Furious 4's destructible buildings. Chainsawing jetpack-Nazis while three buddies on your couch fight beside you isn't exactly the direction I expected Brothers in Arms to go. The only thing wrong with the game is its name. Regardless, fans of Borderlands and other absurd, co-op adventures will have much to look forward to when Gearbox releases Furious 4 around this time next year for HD platforms.